Although gender equity seems to move almost at a snail’s pace in the architectural field, there are a number of outstanding women architects who have built – and continue to build – successful careers, especially in residential architecture. Their ground-breaking vision and sense of style has made an impact on home design – primarily modern style houses – and the incorporation of cutting-edge technologies and materials in the design. Slowly but surely, these women are carving their own paths and transforming a male-dominated culture with their distinctive philosophies, originality, and creative designs. During National Women’s History Month, we celebrate three exceptional female architects who have taken leadership positions in architecture. Here’s a look at Anne Fougeron, Jeanne Gang, and Rocio Romero. The principal of award-winning Fougeron Architecture in San Francisco, Anne Fougeron’s designs and projects are original statements of modern architecture. In this video, meet Fougeron and visit the offices of Fougeron Architecture. One of the most accomplished architects of her generation and one known for taking on difficult projects "without sacrificing aesthetics," Anne Fougeron was born to French parents in Amsterdam, the Netherlands. She was raised in Paris and New York and received her B.A. in Art History from Wellesley College. She moved to the Bay Area and studied at the University of California-Berkeley. Fougeron graduated in 1980 with a Masters in Architecture ... and settled permanently in San Francisco. Prior to setting out on her own, she was affiliated with three different architectural firms in the San Francisco area but was not inspired by the projects they were doing. A self-described Modernist, Fougeron also realized that there were only a few architects in the San Francisco area who did modern work in the mid-80s. She wanted to design her own buildings – and for her to be able to do that, she had to establish her own firm, which she did in 1986. 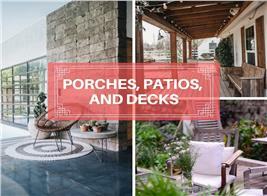 Fougeron started with small projects – bathroom and kitchen remodels and decks. She knew that the only way to get the big-scale projects and “legitimize her practice” was to get her California architecture license. In 1988, she finally completed all the required exams, received her license, and began building modern homes of glass, metal, wood, and stone that are filled with light, comfort, and unique design solutions. Since 1988, Fougeron’s original modernist creations have been featured in The New York Times, San Francisco Magazine, Metropolitan Home and other publications. She has received over 50 design awards over the years for her residential, commercial, multi-housing and civic projects. She is best known for The Fall House, Flip House, Tehama Grasshopper, Ingleside Library, Parkview Terrace, and the 440 House. In 2010, Residential Architect magazine named Fougeron Architecture one of the 50 best architectural firms in the U.S.
A winner of two design awards, the 440 House in downtown Palo Alto put Fougeron Architecture on the map. Completed in 1999, it is a very modern multi-story residence with 5,000 square feet of space, two bedrooms, dining room, family room, kitchen, two studies, exercise room, a wine cellar and a central living room that opens into two gardens – in the front and rear of the house. 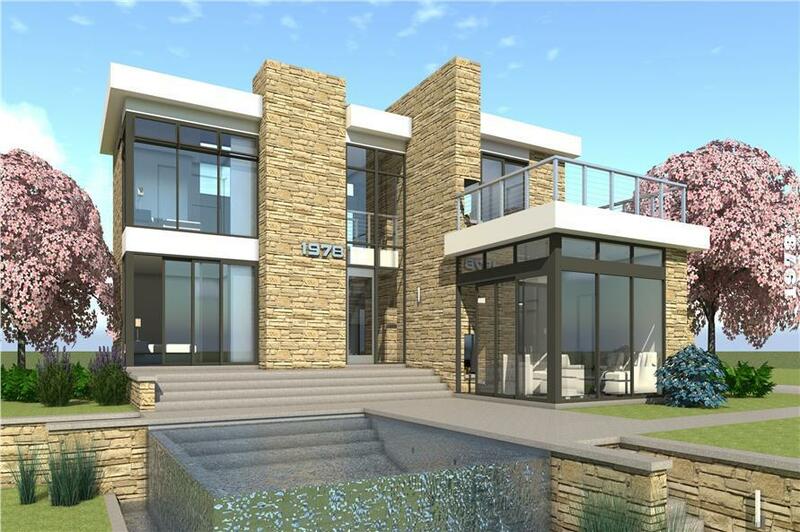 What makes the 440 House spectacular is the use of channel glass, a translucent U-shaped glass that creates uninterrupted walls of glass with minimal framing elements, making it ideal for daylighting applications. Fougeron had seen the textured glass in a housing project in Europe and envisioned the clear and translucent glass on the floors, ceilings, and walls. But there were challenges to be surmounted before she could move forward. Fougeron created a design where the glass planes are held within an exposed steel framing system that allows them to meet each other, turn corners, and move from inside to outside. She traveled to London to get help with the specs from the glass manufacturer, who was selling the channel glass product for the first time in the U.S.
Then Fougeron had to convince the building department of the city of Palo Alto that she knew what she was doing. Fougeron recalled getting all this literature together showing different places it was used around the world, and showing it to Palo Alto city officials to get approval for the construction. In the end, the 440 House was a huge success. Not only is it stunning, but its building elements also make it a safe home in an earthquake region. And with all the glass planes around the house, natural light filters through the house from every angle. With 440 House well-received by her clients and the architecture world, Fougeron confidently moved on with more buildings that feature her signature modern, minimalist, light-filled dwellings. Impressed by Fougeron’s design of the Jackson Family Retreat in a wooded canyon in Big Sur, a Chicago-based executive commissioned the construction of a home on a property he purchased in the area in 2006. He wanted a home filled with natural light and made of a mix of materials and he wanted Fougeron on board. Fougeron called the challenge of designing a home "in one of the most spectacular natural settings on the Pacific Coast that would both respect and transform the land" as one that required a form more complex than a giant picture window. The result: A breathtaking three-bedroom home on a triangular 1.5 acre site in Big Sur with dramatic views of the Pacific Ocean. Called Fall House, the modern California style home is staggered down a cliffside and features a cantilevered master bedroom suite. Copper clad walls line the south façade of Fall House. The copper clad roof overhangs protect windows and the front door from the sun and the wind of the ocean. The north façade features floor-to-ceiling expanses of glass for great views of the natural landscape. The concrete wing that runs perpendicular to the main section of Fall House features a porthole and is described as "the boulder locking the house to the land." It also shows a clear view of the copper clad south façade. View more in the video above. The house features two rectangular boxes connected by an all-glass library/den. The open plan interior with the kitchen, living and dining rooms has a sloping ceiling, timber beams and a floor that goes downward like a set of stairs. Fougeron calls the interior a shelter, a refuge in contrast with the roughness and immense scale of the ocean and cliff. A one-story concrete wing perpendicular to the house that includes another bedroom, building services, and a green roof completes the elements of Fall House. From one innovator on the West Coast, we move to the Midwest and the Windy City to take a look at what Jeanne Gang and her firm have done to change the architectural landscape in Chicago and other major cities in the U.S.
Jeanne Gang is recognized internationally for major projects that include residential, cultural, mixed-use towers, and university buildings. In 2011, she was the recipient of the MacArthur Fellowship, a $500,000, no-strings-attached grant for individuals who have shown exceptional creativity in their work and the promise to do more. In 2006, Gang presented a talk to TED on the topic "Buildings that Blend Nature and City." The lead image in the video is that of Aqua Tower, the tallest skyscraper designed by a woman, features residential and office spaces in Chicago, Illinois. The Architectural Review’s 2016 Architect of the Year and MacArthur Fellow, Jeanne Gang is known as a designer of both show-stopping skyscrapers and sensitive small-scale buildings. From the Aqua Tower to the Brick Weave House to the Campus North Residential Commons at the University of Chicago, City Hyde Park, and other projects, Gang has produced a variety of fascinating design work across the country. Born in Belvidere, Illinois, Jeanne Gang spent her childhood vacations on the road with her family – touring bridges, the Grand Canyon, and rock formations of the Great Lakes. The sights she saw during those trips have come together in most of her designs today. A 1986 graduate of the University of Illinois at Champaign-Urbana with a degree in architecture, Gang studied urban design at the Swiss Federal Institute of Technology in Zurich. She received her master’s degree in architecture from Harvard University in 1993. She also worked for Dutch architect Rem Koolhaas in Rotterdam as a project architect and lead designer. Gang established Studio Gang Architects in 1997. Perhaps Jeanne Gang’s most famous building, the 82-story skyscraper Aqua Tower, which rises to more than 870 feet on the Chicago skyline, is located in Lakeshore East next to Lake Michigan. 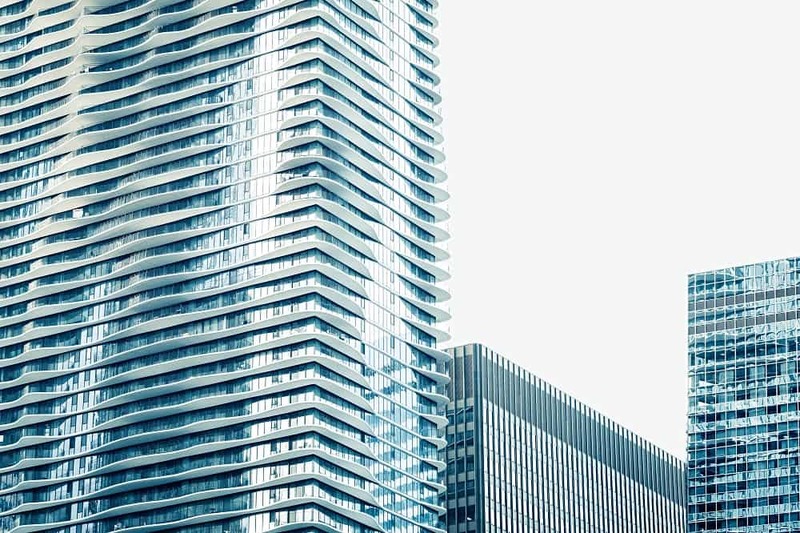 Completed in 2009 and named Skyscraper of the Year, Aqua Tower is described as planet-friendly because of its rainwater collection systems, heat resistant and fritted glass, and energy-efficient lighting. The wave-like forms of the balconies were inspired by the “striated limestone outcroppings that are a common topographic feature of the Great Lakes region.” The balconies also help to break up gusty winds characteristic of Chicago, shade and protect neighboring apartments from the sun, and prevent birds from bumping into the glass windows that surround the Tower. Residents of Aqua Tower are enjoy their balconies while taking in the views of Chicago's parks and landmarks. 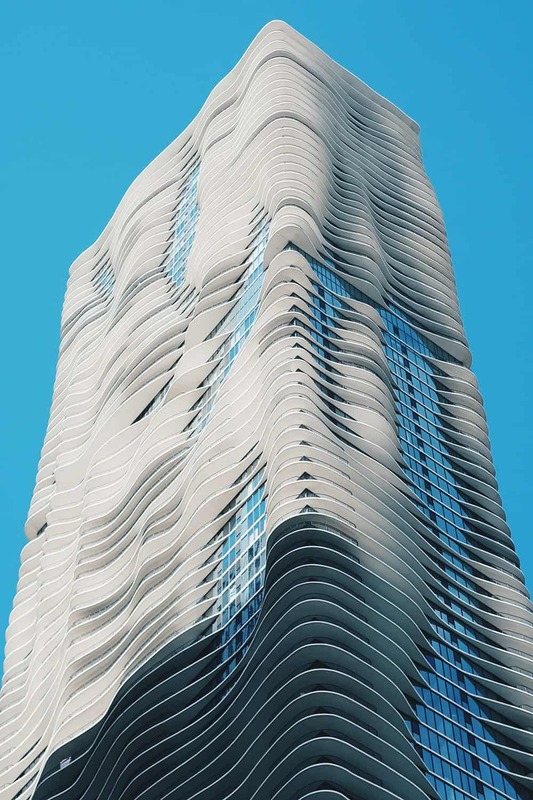 The balconies take on the form of undulating waves – a design that gives Aqua Tower a unique and eye-catching look. There’s nothing like nature to make a building distinctive and exceptional. 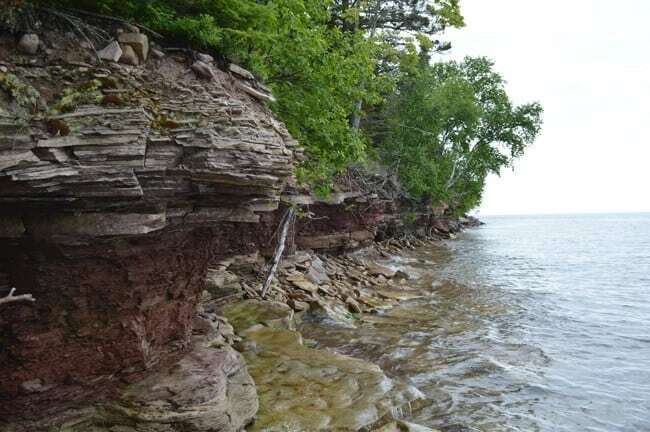 Grooved limestone formations of the Great Lakes Region inspired the design of Aqua Tower’s balconies similar to these sandstone formations found in Keweenaw National Historic Park, Michigan. 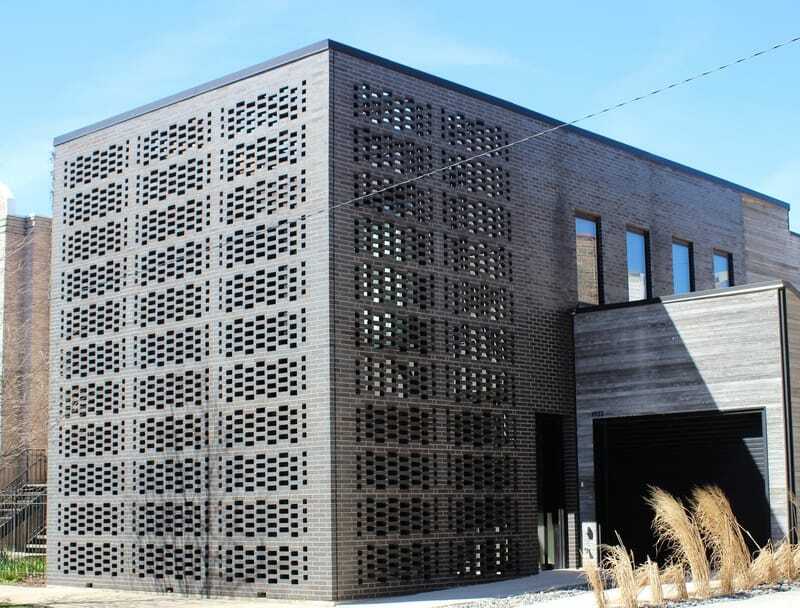 Aqua Tower may have put Jeanne Gang on the architectural radar but her other designs are also noteworthy, including her renovation of Brick Weave House, located about two miles from the Chicago Loop. It is home to Chicago advertising executives David Hernandez and Tereasa Surratt – and their eclectic collection of cars and motorcycles. In the 1880s, the property was a wood-frame stable in the city’s West Town neighborhood that was added on to by its previous owners over the years. Hernandez purchased the home, which had been turned into a bachelor pad in 2003 by a previous designer. The redesign was not completely to the satisfaction of Hernandez and Surratt, who wanted to highlight some of the stable’s historic features. Enter Jeanne Gang and her firm. While the idea was to remodel the home, a complete renovation had to be undertaken when fire damage was discovered in the old structure, and about 30 percent of the building had to be torn down. Studio Gang started the redesign by removing the original front walls and roof, creating a front garden and surrounding the two-story home with a brick screen that enclosed the private courtyard – hence the name Brick Weave House. The screen is supported by steel columns and beams that extend outward from the roof as well as horizontal trusses embedded in mortar. Gang noted that the enclosure is not a wall; people come and stare through. The opening on the brick screen enclosing Brick Weave House allow natural light to pour into the interior – and create a beautiful pattern with the shining of interior light at night. The stable structure was converted into two floors and the garage relocated to the side of the house, which originally included living space. The repositioning integrated the home’s interior with the garage – so, from the dining room, people can look out into the garage and see the couple’s vintage cars. The open floor plan – which is roomy and suitable for entertaining - includes a spacious living area with 20-foot ceilings. There is a small galley kitchen, creative storage and rooms on the second floor – accessible through wood stairs – that can be transformed into bedrooms. The master suite is designed with floor-to-ceiling glass walls that provide an unobstructed look into the garden. Hernandez and Surrat stayed out of Gang’s way as promised, and she delivered a home that matched their aesthetics and vision. Today, Studio Gang continues to design and develop distinctive and awe-inspiring buildings across the U.S. and abroad. Rocio Romero: “I am committed to producing simple, modern, green designs”. One of the pioneers of affordable and sustainable housing, Rocio Romero has been called the reigning queen of prefab homes. In the video above, she is intereviewed about her prefab homes from the kitchen of her own. Romero shares a modern 1,150 sq.-ft., 2-bedroom, 2-bath prefab weekend retreat in Southeast Missouri with her family. In the video above, Romero meets with Justin Gunn from Current TV and gives him a personal tour. In an interview, Romero recalled that she was 18 years old and backpacking through Europe when she realized that she wanted to design buildings. She studied at the University of California-Berkeley and earned a Bachelor of Arts degree in Environmental Design with a major in Architecture. She graduated from Southern California Institute of Architecture with her Masters in Architecture. Located in a vacation area in British Columbia with gorgeous views, this 1-story, 3-bedroom, 2-bath prefab home is the largest in Romero’s prefab series. Spread across 1,400 sq. 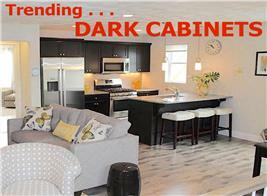 ft. of space, the home features a kitchen, dining area, utility room, and large deck. 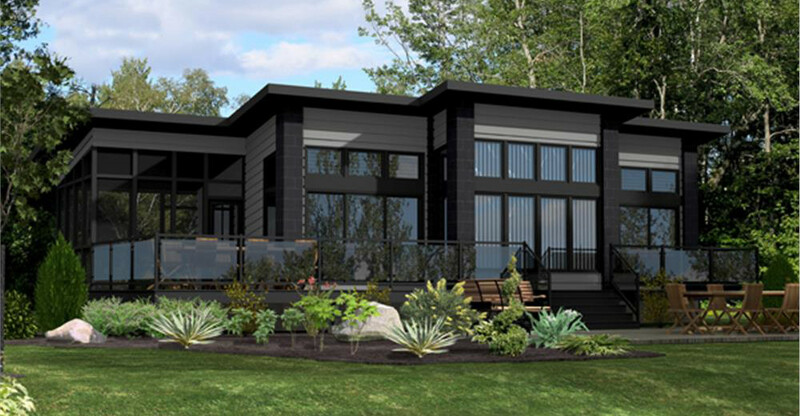 Not a prefab but similar in style to the home above, with its large expanse of glass, this open-floor-plan modern style home has 2 bedrooms and 1 bathroom in 1,092 sq. ft., all on one floor with a large wraparound deck for relaxing and enjoying the view (House Plan #158-1031). Romero has focused her career on domestic and residential architecture and while her designs are ultra-modern, they are eco-friendly and sensitive to the environment. Her work has been featured in numerous publications and museums, including the Walker Art Center, The Museum of Contemporary Art in Los Angeles, the Vancouver Art Gallery, and the Triennale di Milano. In 1999, Romero worked on her first design – a home for her parents in Laguna Verde, Chile – which inspired the name for her “LV” series. When she worked on the Laguna Verde home for her parents, prefab was big in Europe but had not caught on in the U.S. Romero has said that she chose prefab work because she wanted to influence how her designs were built as well as control construction costs. Although she faced a lot of challenges, she focused on her goal and designs. Encouraged by her husband, Cale Bradford, Romero designed their weekend home in Missouri and built it with him. The home is situated on a 69-acre property in the Perryville area. It features floor-to-ceiling windows that allow a lot of sunlight into the home as well as great views of the outdoors. Romero also designed a fish camp and a base camp on the property. Romero’s prefab homes can be customized – additional rooms, basements, porches, and decks can be specified. 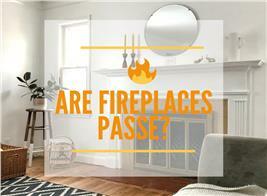 Most of the homes are manufactured and packed in Missouri and then delivered to clients. They can be assembled and be “move-in ready” in a few months’ time. The home in Laguna Verde, Chile, designed for Romero’s parents, sits on top of a hill and has terrific views of the ocean and mountains. That home and location were the inspiration for Romero's "LV" series of prefab homes. The above video provides and exterior and interior walk-through of an actual LV prefab "kit" home. 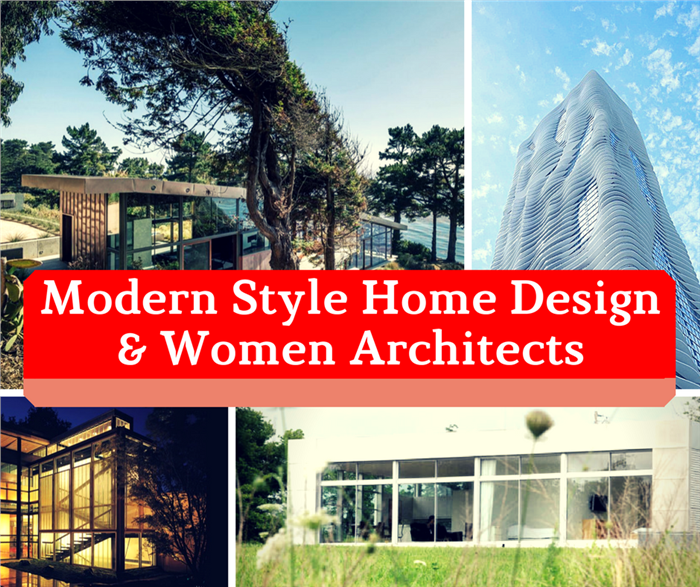 Once again we cheer on these amazing women for their creativity, originality, and leadership in architecture. We celebrate their achievements – especially during National Women’s History Month!